Earlier, I looked at the Running Sum query. A similar (but opposite) problem is the Difference Between query. Unlike a running sum, which adds the value of a field in a record to the value of the same field in the previous record, the "difference between" query subtracts the value of the previous record from the value of the current record to show the difference. Figure1: Need to calculate the difference between records. The difference in days between records 1 and 2 is 4, between 2 and 3 is 7, between 3 and 4 is -22, and so forth. 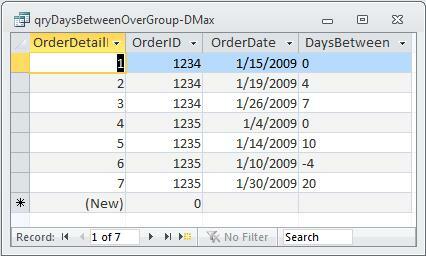 The problem is that SQL does not have positional notation like Excel does. There's no way to simply point to the record above the one you're on. The only way to do it is to somehow identify the previous record in terms of a Where condition. Since this Where condition must be evaluated for each line, I can do this with a domain aggregate functions (DMax & DLookup). The technique is similar to creating a Numbered Query or a Running Sum in a query, but instead of just counting or summing all the records above the current record, I have to find just the previous record. This adds an additional complication, which requires an additional domain function. 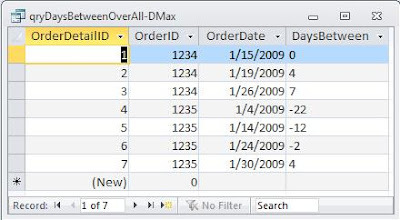 Use a domain function (DMax) to find the unique identifier the previous row. And then subtract the previous value from the current value. One way to show the difference between records is over the whole recordset. Later, I'll look at showing the difference between over groups of records. Next, I'll feed that to a DLookup function, which will return the date value from the previous row given number of records. The two NZ() functions are needed to display a zero on the first line. Otherwise, it would return an ERROR. The Order By clause in the query is important. This will sort the query on the OrderDetailID field. I'll need to have that order to use the criteria argument in the DMax. Figure 2: Shows the time difference in days between subsequent records. Figure 3: As the OrderID changes, the DaysBetween resets to zero. to the "Where" condition of the DMax function. This sets the value of the first record of each group to zero.